Ronald Koeman: What's the secret behind his Southampton success? The Dutch like mayonnaise with their chips. I've seen them do it, they drown them in that stuff. But as a budding professional, Ronald Koeman liked mayonnaise with his chips so much it became a matter of principle. "The first time I saw Ronald he was this plump kid with white hair and freckles on his face," says former Hull City and Newcastle United striker Rob McDonald, who joined Koeman at FC Groningen in 1982. "But he had this arrogance about him, a certain authority, even when he was 19. "We were at an away game once, having our pre-match meal. Our coach, Theo Verlangen, would go mad if he saw mayonnaise on our table. But this time he wasn't paying attention when the waiter put some down in front of us. "Ronald took a couple of chips, slapped them in the mayonnaise and just as he was about to eat them, Verlangen said: 'Koeman! If you eat those, that's a 500 guilder fine!' Ronald stuffed them in his mouth and said: 'Make it a thousand.'" A thread runs all the way from that cute tale of quiet assurance to the moment he was dropped for Barcelona by the great Johan Cruyff for a European Cup tie in 1993. "Boss," said Koeman. "This is the first time and also the last time." And so it was. Koeman has always been a steely soul who usually gets his way. It was this quiet confidence that led to him accepting the manager's job at Southampton when many thought they were nailed on for relegation from the Premier League. Where others saw imminent disaster, Koeman saw a long-term challenge. Having lost a gaggle of key players, Koeman was confident equivalents could be found. He brought in winger Dusan Tadic from FC Twente and striker Graziano Pelle, whom he had worked with at Feyenoord, for a total of £19m. He also rebuilt at the back, signing goalkeeper Fraser Forster from Celtic and adding defenders Toby Alderweireld and Ryan Bertrand, both on loan deals. But perhaps the best indication of his abilities as a manager is how those players who were already at St Mary's when he arrived in the summer of 2014 - the likes of defenders Jose Fonte and Nathaniel Clyne, midfielders Morgan Schneiderlin and Victor Wanyama - have flourished under his leadership. "He was an amazing player who played for big clubs, so he's got this experience inside him," says Schneiderlin, who joined Southampton from Strasbourg in 2008. "He can read the game and can identify a good player. But what I like about him is that he's a calm person and good with human beings. "The new signings didn't take too long to adapt, after a month it felt like they'd been here two or three years. Some football clubs make a lot of changes and they can't adapt. We made changes and the club's mentality stayed the same." 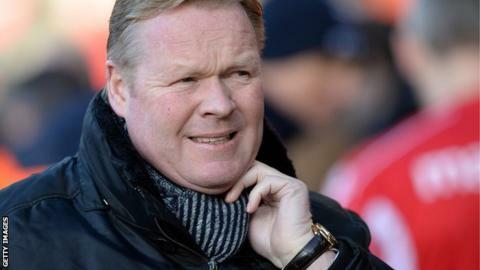 Those who knew Koeman in his previous incarnation - as one of the world's most dynamic defenders, who won two European Cups and a European Championship with the Netherlands - are surprised by the start he has made at Southampton, steering them to fourth in the table. But not all that surprised. "They lost so many great players and integrating new players usually takes half a year or longer," says Ronald de Boer, a former international team-mate of Koeman's who was at Barcelona when Koeman was Louis van Gaal's assistant. "That they're already there says something about the players but also about the manager and his understanding of his players. He could always express himself very well - as a captain and coach he chose his words very carefully and was always very clear. So I always saw him as a manager. "I think the Dutch national team made a mistake not appointing him when they had the chance [Guus Huddink was appointed Van Gaal's successor after the 2014 World Cup]. It was time for a younger manager and Koeman wanted it badly. Southampton should be very thankful to the Dutch federation." Groningen (1980-83) ,Ajax (1983-86), PSV Eindhoven (1986-89), Barcelona (1989-95), Feyenoord (1995-97), Netherlands (1982-94). Vitesse Arnhem (2000-01), Ajax (2001-05), Benfica (2005-06), PSV (2006-07), Valencia (2007-08), AZ(2009), Feyenoord (2011-14), Southampton (2014-). Total games: 695. Total goals: 239. Total games: 544. Win percentage: 55.88. It hasn't all been plain sailing for Koeman. After an early-season, 10-game run that included eight wins and only one defeat, the Saints ran out of wind, losing four successive Premier League matches. Some observers thought the honeymoon was over. Koeman, supremely confident in his own methods, knew different. "Ronald does everything he can to win," says former Netherlands goalkeeper Hans van Breukelen, also a team-mate of Koeman's at PSV Eindhoven. "He's almost obsessive about it. But he also has an accepting side. "I can't remember ever seeing him nervous, not even when he first came into the national team as a 19 year old. That's because he believed in himself and his skills and opinions. If you believe in yourself, why would you be nervous? "He knows he's put everything into every game, he knows his teams prepare properly for every game, but he also knows his teams won't win every game." David Endt is a journalist who was Ajax general manager when Koeman was boss at the Dutch giants between 2001 and 2005, winning the Eredivisie twice. Endt remembers Koeman as a gentle, reserved man, in marked contrast to Manchester United boss Van Gaal. But Endt believes Koeman's serene demeanour cloaks a man who is every bit as driven as his Premier League rival. "They don't differ much in their football philosophies but they are very different personalities," says Endt, who was Van Gaal's press officer at Ajax between 1993 and 1997. "Van Gaal is blunt, says what he thinks. Sometimes he would explode if things were done wrong, he could be very fierce. Koeman was very nice to work with, could be very easy-going. But you could feel his ambition. "That's one of the beautiful things about football, there isn't one law, one truth. Maybe Koeman has the capacity to achieve similar things to Van Gaal, but in a different way. " Koeman might be single-minded, but he has also learned that one of the keys to successful leadership is surrounding yourself with the right people. With this in mind, he installed older brother Erwin, by all accounts a more outgoing personality, as his assistant manager. Liverpool legend Sammy Lee, one of the most respected and infectious coaches in English football, is also on board. And while outsiders thought Koeman was joining a club in crisis, Koeman's risk was a calculated one, because he had done his homework and knew he was actually joining one of the best-run clubs in England. He trusted Southampton's scouting system and the ability of its academy to produce players good enough to replace those who will inevitably leave for 'bigger' clubs, as Adam Lallana, Luke Shaw and Calum Chambers did last summer. And in the club's forward-thinking director of football Les Reed, he saw a kindred spirit. "Southampton have got a Dutch scenario in place," says McDonald, who now recruits professional coaches in the Netherlands. "The way Southampton bring players through their youth system is pretty normal in Holland. "And he was smart enough to go in there, see how they had been trained and accept that Mauricio Pochettino [who joined Tottenham last summer] had done a great job before him. Therefore it was just a case of adding his little nuances." It is doubtful Southampton's state-of-the-art training centre, opened last November, serves mayonnaise in its canteen. But the odd dollop never did Koeman any harm. Memo to Les Reed: mayo at away games (maybe just once a week).